Foundation – Visiting Scholar at the Stanford Center on Philanthropy and Civil Society. She serves as Academic Editor of the Stanford Social Innovation Review. 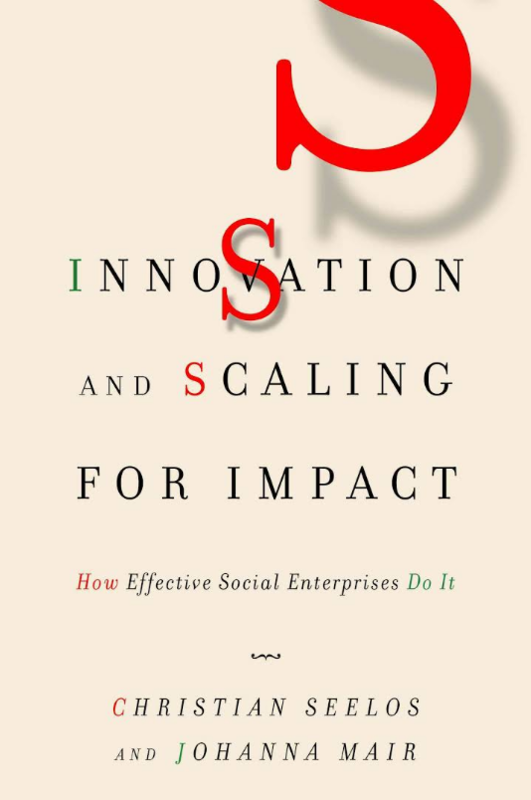 Innovation and Scaling for Impact forces us to reassess how social sector organizations create value. Drawing on a decade of research, Christian Seelos and Johanna Mair transcend widely held misconceptions, getting to the core of what a sound impact strategy entails in the nonprofit world. They reveal an overlooked nexus between investments that might not pan out (innovation) and expansion based on existing strengths (scaling). In the process, it becomes clear that managing this tension is a difficult balancing act that fundamentally defines an organization and its impact. The authors examine innovation pathologies that can derail organizations by thwarting their efforts to juggle these imperatives. Then, through four rich case studies, they detail innovation archetypes that effectively sidestep these pathologies and blend innovation with scaling. Readers will come away with conceptual models to drive progress in the social sector and tools for defining the future of their organizations. Please, confirm your attendance by email to Joëlle Quentin (jquentin@escpeurope.eu ). For people who aren’t members of ESCP Europe, if you wish to attend, please print this announcement and show it at the welcome desk.